Here in Texas our food/cooking is all our own. We have our own style of ‘southern cooking’ our own style of BBQ, authentic Mexican food that you can’t get any where else. And of course the all encompassing ‘Tex-mex’. Of course I love it all. But the Mexican/Tex-mex is what most people want and the thing they rave about when they come to visit. One thing that we all love here n Texas is Breakfast Tacos. Never heard of them? Well you aren’t the only one! When Eric first moved here he was perplexed by these things everyone called breakfast tacos. HAHAHA! He says in Georgia (where he’s from) they don’t have them. I was astonished and immediately had to introduce the two of them! 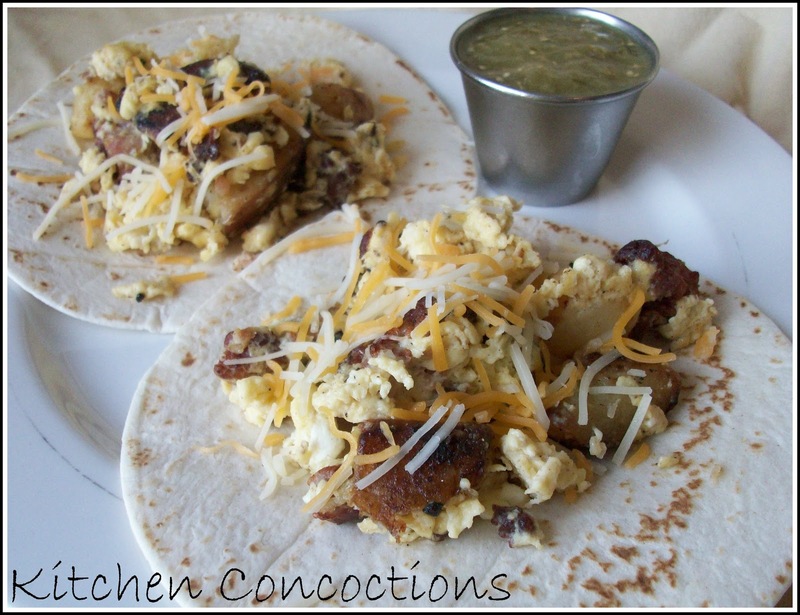 Breakfast tacos are so easy and I have never meet anyone who didn’t like them! 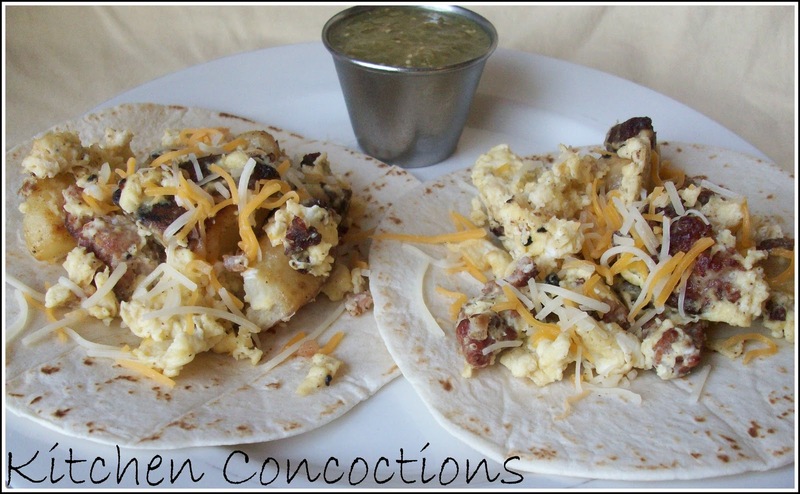 You totally make them your own by adding your favorite breakfast mixings to a tortilla (kinda like an omelet). Potatoes and eggs, bacon and eggs, veggies and eggs. You get the point. Eric and I love to do sausage, eggs, and potatoes. Tasty, filling, and again easy! Heat a large skillet over medium-high heat. Add sausage and brown, breaking meat apart as you cook. Drain grease and set aside. Place potatoes in a large pot and cover entirely with water. Bring to a boil and cook until potatoes are fork tender, about 10 minutes (note: you do not want them to be too soft or they will fall apart). When they are ready, place the potatoes on a cutting board and dice them into 1-inch pieces (be careful because they are hot). In a large skillet heat oil over medium-low heat. Next, throw in the diced potatoes. Stir well. Add the seasoned salt and herbs de provence. Cook the potatoes until they are golden brown and crispy, about 15 minutes. While potatoes cook crack eggs into a large bowl. Add water and paprika. Whisk eggs until the yolks are broken. Stir in the precooked sausage and cheese. Heat a large skillet over low heat. Add egg mixture. Cook eggs until they are light and fluffy. Serve eggs/sausage mixture with cooked potatoes in warm flour tortillas. Top with additional cheese and your favorite salsa! « And the count down begins!! !